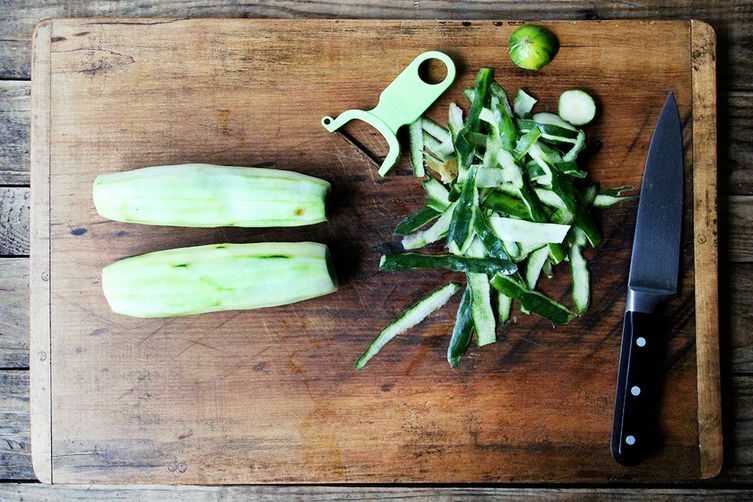 Alexandra Stafford shows us how to help cucumber salad live its best life. A few weeks ago, a cucumber salad I brought to a neighborhood gathering threw me into a tizzy: It tasted bland. It looked tired. I couldn’t handle it. I asked myself what went wrong again and again as I periodically made my way to the buffet table to give the cucumbers a toss, hoping the juices pooling at the bottom of the bowl might revive the salad. Breaking Julia Child’s cardinal rule, I apologized for my dull contribution to the dinner and continued to obsess until my husband gave me a look that said: No one cares about your cucumber salad but you. It made perfect sense. Like so many water-filled vegetables, cucumbers benefit from a brief salting, a simple but important step to draw out moisture and prime them to receive a dressing. So while the salad I had made promised to be great—farmers market cucumbers, basil from the garden, a flavorful dressing—it had been doomed from the get go: With all of that cucumber water, it didn’t stand a chance. I tested Alice Waters’ method later that afternoon, salting the cucumbers before tossing them with vinegar, olive oil, and herbs. One bite calmed my restive brain and reminded me how good cucumber salads can be—and, above all, assured me my public meltdown hadn’t been in vain. This time of year, farm stands abound with both small pickling cucumbers and larger slicing cucumbers—look for cucumbers that feel firm and heavy for their size rather than spongy or soft. And because they dry out soon after they're picked, store them in a bag in the vegetable bin of the refrigerator for 3 to 5 days. This time of year, nothing is more refreshing than a chilled soup, many of which take almost no time to whip up. Here are three great versions: yogurt soup with cucumbers and walnuts, cucumber and avocado soup with mango salsa, and white gazpacho made with cucumbers, grapes, and sherry vinegar. Crisp, cool salads are a good idea, too: Here’s a crunchy and creamy salad made with avocados, lime, and mint. Or try a genius salad made with smashed cucumbers hit with a wok-fried chile oil. Cucumbers sliced thinly and layered in a vegan nori wrap with hummus, radishes, and sprouts make a healthy but satisfying lunch. And of course, cucumbers are ideal for pickling. 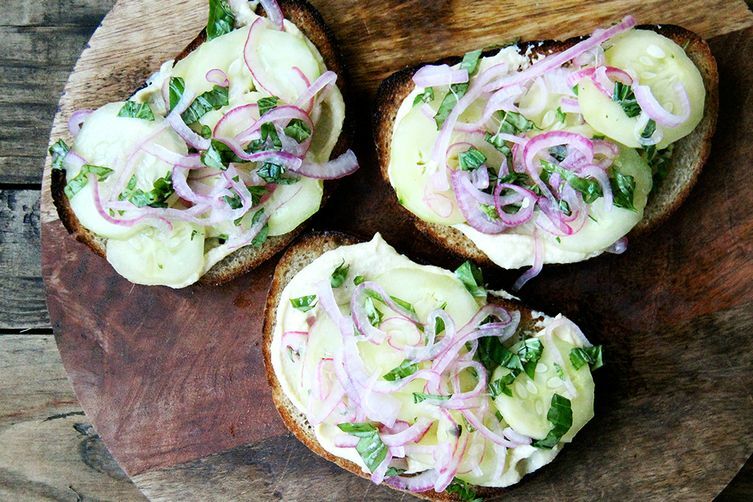 This seven-day recipe will leave you with a boatload for the summer. Finally, treat yourself to a hothouse cooler: a refreshing margarita flavored with cucumber juice, grapefruit, and lime. The secret is always chaat masala. Adding a little sugar along with the salt so you're essentially brining the cucumbers makes for a delicious salad too! So true! 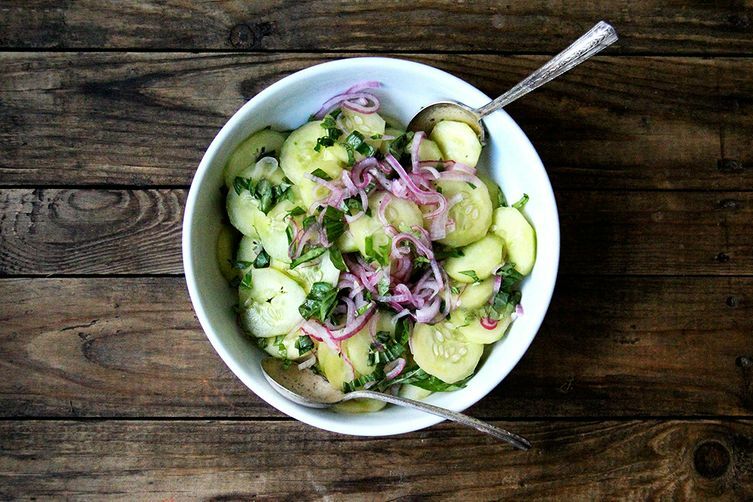 I used to be obsessed with this ginger-vinegar-sugary cucumber salad and the brine was SO good. Wow, amazing! Such a great tip. More and more I keep so much produce out of the fridge, but I've always kept cucs in the fridge. Going to experiment! Zaqary, I had so many adorable little Boothby Bay Blonde cucumbers from a local organic farmer the other day that in desperation I googled the (legendary) Julia Child recipe for Braised Cucumbers. It seemed like a lot of work for a few cukes, so I adapted it I sauteed them in a little bit of unsalted butter, added a drop of lemon juice and a handful of chiffonaded basil. It was sublime and a total surprise. 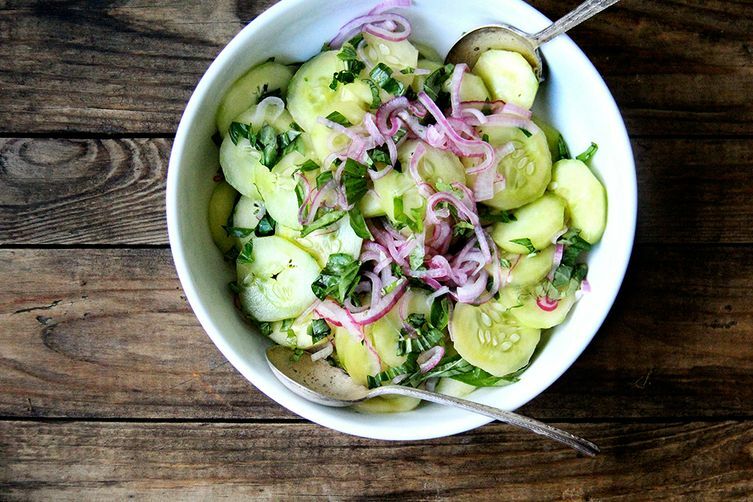 Hungarians make a simple cucumber salad -- yes, salt thinly sliced (& peeled) cucumbers and let sit for at least 1/2 - 1 hour. Then you squeeze out the water (okay to rinse first to get some of salt off). 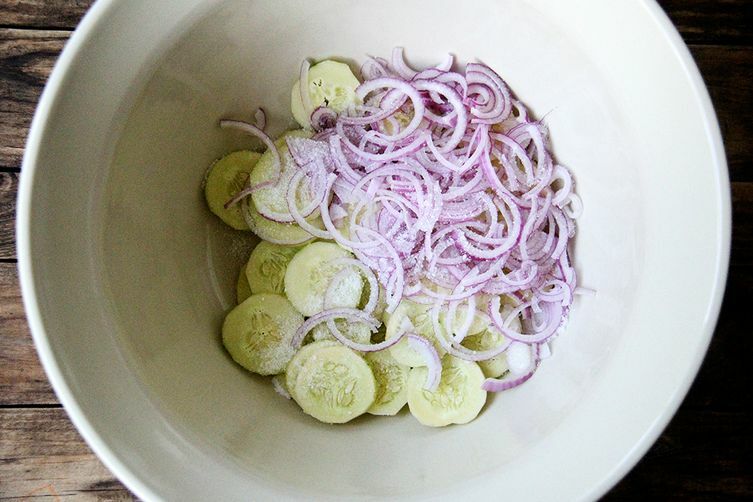 We dressed the salad with white vinegar only and some thinly sliced sweet onions. Sprinkle bowl of salad with paprika. Leftover salad will last several days in fridge. This would be good with rice vinegar. Love the idea of paprika! So interesting. Would anyone have any cooked cucumber dishes? I ate one once at a Chinese restaurant in Manhattan, but I couldn't tell you what was in it. Oh, wow — this sounds so good/interesting. Going to have to try this. I try to find smaller cucumbers, they seem to be a lot better for salads and sandwiches. In my garden they may go from small to very large overnight, though! Yes, absolutely! Small cucs seem to have smaller seeds and rarely taste bitter to me. Thanks! I make cucumber in 2 ways. First is the raita. Peel & dice into small pieces. Add plain yogurt, thin slices of green chile peppers, some cumin powder and salt. Second way is called "savory cucumber" in my mother tongue. Soak yellow split moong beans in water for an hour or two. Grind these soaked beans coarse. Peel and dice cucumbers. Mix the beans, thinly sliced green peppers, salt and some lime juice. Top it off with "tadka" or oil seasoning - heat 2/3 tbsp of vegetable oil or Canola. Just before oil starts smoking add 1/2 tsp of black mustard seeds and a pinch of turmeric. Hit the cucumber and bean mixture with this tadka. The sound and smell that follows is divine. Yum! I've never heard of tadka — sounds interesting! Going to have to order some. I love raita, too.